Whether presenting to a class or audience, for most, interactivity is appreciated. One technique I enjoy is to ask participants to discuss an issue with colleagues. I generally leave the presentation platform to access the timer and countdown music, then come back to it. But that can get annoying and sort of glitchy. I thought there had to be a better way. 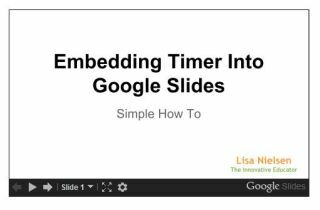 There is.The trick is that you embed a timer that has been turned into a YouTube video. YouTube is used because it can be embedded into most presentation platforms. Then you use a picture in picture technique to indicate time is running out with game show music and follow that up with a "time is up" sound effect. I tested this last week when speaking to several hundred parents (picture below( interested in learning about the home-school connection. It worked great. Try it out in your own setting and comment to let us know how it goes.